One of the curious aspects of the coffee industry is the huge range of badges and certifications. As well as the urbiquitous ‘Great Taste’ award – that black and gold sticker that seems to adorn the majority of coffee packets – there’s Organic, Rainforest Alliance and Fairtrade, to mention a few. 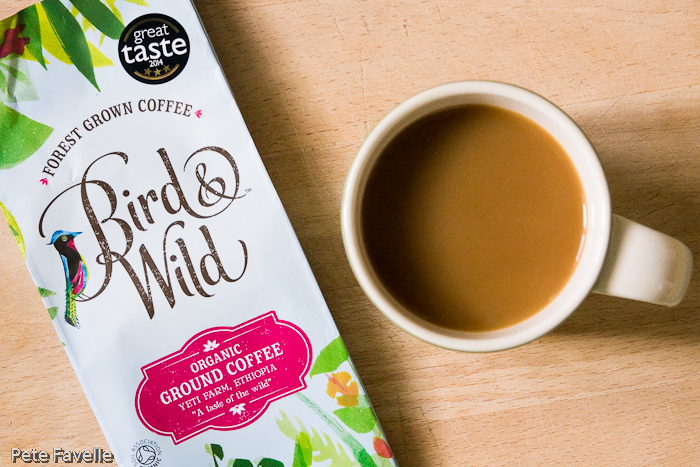 Today’s coffee introduces me to a new one – Bird Friendly Coffee. This is a certification scheme run by the Smithsonian Institute, and aims to promote coffee growing practices which support the conservation of migratory birds – primarily through shade grown coffee, although there’s a list of other requirements as well. Shade growing is exactly what it says; growing coffee under the shade of other trees, in a manner closer to the way the bush grows naturally. This encourages species diversity – it’s not just migratory birds that benefit – as well as reducing water usage, pesticide use and soil erosion. Of course, there are plenty of other shade-grown coffees available that don’t carry the Bird Friendly label but it often takes a fair amount of exploration to find those sort of details on websites, so it’s nice to see companies like Bird & Wild starting to produce coffee with the logo on the packet. This is their Yeti Farm Forest Coffee, from Ethiopia. Yeti Farm was actually the first coffee farm in Africa to gain the Bird Friendly certification, which makes it a fitting choice for my first Bird Friendly coffee. The grounds have a light aroma, of sweet honey and delicate citrus with just a little vanilla pod lurking in the background. Brewed, the sweet, light citrus aroma is more pronounced. In the mouth, the theme continues – light, gently honey-sweet with a generous, almost floral acidity that carries into a surprisingly lengthy, fruity finish. It’s lighter than my usual style, but it’s a refreshing morning coffee – 3.5 stars. Many thanks to Bird & Wild for this sample.